This image from zooms into a small portion of the planet-hunting Kepler's full field of view - an expansive patch of sky in the Milky Way galaxy. At center is a star with a known 'hot Jupiter' planet, named 'TrES-2,' zipping closely around it every 2.5 days. This story was updated at 8:09 p.m. EDT. Theplanet-seeking Kepler spacecraft has beamed home its first images of a patch ofthe sky where NASA hopes to find Earth-like planets circling distant, alien stars. 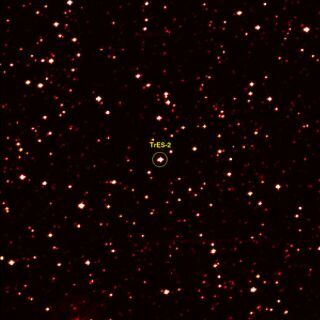 Some 14million stars are estimated to lurk within the first views from Kepler, whichNASA released Thursday. The images reveal a swath of stars between theconstellations Cygnus and Lyra that fill an expansive area of our Milky Way galaxy which, when seen from Earth, is about the size of human hand held up against the night sky at arm's length. "It's thrilling to see this treasure trove ofstars," said William Borucki, Kepler?s science principal investigator atNASA's Ames Research Center in Moffett Field, Calif. "We expect to findhundreds of planets circling those stars, and for the first time, we can lookfor Earth-size planets in the habitable zones around other stars like thesun." Theso-called ?habitable zone? around a star is a belt in which liquid water couldexist on the surface in lakes, rivers or oceans. Too close to its stellarparent and a planet would be too hot, while an orbit too far out would yieldonly a frozen world, NASA scientists have said. The firstimages from Kepler released by NASA include views of its entire target zone, as well as up-close shots that zoom in on only a fractionof the full star field. One view includes a cluster of stars some 13,000light-years from Earth known as NGC 6791, while another image includes a starcalled Tres-2, which is already known to harbor a massive Jupiter-like planet close by. "Kepler'sfirst glimpse of the sky is awe-inspiring," said Lia LaPiana, NASA?sKepler's program executive at NASA?s headquarters in Washington, D.C. "Tobe able to see millions of stars in a single snapshot is simplybreathtaking." NASAlaunched the $600 million Kepler spacecraft last month to sift through thosemillions of targets for 100,000 pre-selected candidate stars that may haveEarth-sized planets around them. Those target stars sit between 600 and 3,000light-years from Earth. The spacecraft was built by Ball Aerospace in Boulder,Colo., and is slated to last at least 3 1/2 years. At Kepler?sheart is a 95-megapixel camera, the largest ever launched into space, whichthe spacecraft will use to hunt for Earth-like planets. Astronomers havediscovered more than300 extrasolar planets to date, but most of them are massive gas giants thesize of Jupiter or larger. Keplerspacecraft is expected to identify new extrasolar planets by casting anunblinking stare at its target star field. Its sensitive camera will record thetell-tale dip in light created by a planet as it crosses in front of its parentstar as seen from Earth. While researchers expect to discover a wide range ofnew planets with Kepler, it?s those rocky worlds the size of Earth that theyare most eager to find. "Everythingabout Kepler has been optimized to find Earth-size planets," said JamesFanson, Kepler's project manager at NASA's Jet Propulsion Laboratory inPasadena, Calif. "Our images are road maps that will allow us, in a fewyears, to point to a star and say a world like ours is there." Last week,the spacecraft popped the protective lid off its delicate telescope optics andphotometer to prepare for its planet search. Mission managers and scientistsplan to spend the next few weeks calibrating Kepler?s photometer and alignmentbefore beginning their hunt for Earth-like worlds in earnest. "We'vespent years designing this mission, so actually being able to see through itseyes is tremendously exciting," said Eric Bachtell, the lead Keplersystems engineer at Ball Aerospace.